Weight loss, stomach surgery, genetics, and childbirth can all affect the abdominal contour. After time and trauma, many people can become frustrated with their loose, sagging skin and excess abdominal tissue. Skin laxity and stubborn deposits of stomach fat are often resistant to exercise or diet, keeping patients from achieving their ideal toned, flat abdominal appearance. Do you have excess skin, tissue, or fat that takes away from the contour of your abdomen, or interrupts the shape of your figure? Achieve a smooth, attractive stomach with a Tummy Tuck at The Hamlet Clinic. If you would like to learn more about how The Hamlet Clinic can achieve the abdominal contour that’s just right for you and your unique figure, call our helpful staff to schedule your private, informative consultation today! Tummy Tuck surgery has helped thousands of people recover their figures after undergoing weight loss, childbirth, or previous surgery. A Tummy Tuck removes loose excessive skin, fat and tissue that causes hanging or bulging from the abdomen. A Liposuction procedure may be performed alongside a Tummy Tuck to achieve targeted removal of fat on the patient’s flank and stomach. Dr. Grant Hamlet is a VASER liposuction specialist who can recommend a liposuction method that will achieve your ideal, sculpted results, as safely efficiently as possible. During your Tummy Tuck, your surgeon will also tighten or repair your underlying abdominal muscles. This will guarantee that the abdomen lies flat, for years to come! Repairing the muscles often restores patients healthy posture and muscular control. Your surgeon will lay your skin back over your repaired and slimmed abdomen to achieve a toned, flat appearance. Once the muscles have been repaired and excess tissue, fat, and skin have been removed, your incision will be closed with sutures. Tummy Tuck is performed by making a single incision low in the patient’s abdomen. The incision will be easily concealed by clothing or swimwear. Sometimes, an additional incision will be made around the belly button to address excess skin in this area. If a larger extent of work is required, the belly button may need to be repositioned. Patients who only need to address abdominal sagging or bulging that occurs below the belly button are candidates for a Mini Tummy Tuck. A Mini Tummy Tuck is also performed by making an incision low in the abdomen. Your surgeon will remove excess fat, tissue, and skin from below your belly button. The belly button will not need to be repositioned to perform a Mini Tummy Tuck. Loose, Sagging Abdominal Skin. Skin can become stretched as a result of weight loss or childbirth. Without their excess, hanging skin, patients enjoy improved mobility and self-confidence. Excess Fat and Tissue. Stubborn belly fat can conceal what is an otherwise fit, toned physique. A Tummy Tuck will remove this fat and tissue to reveal the healthy body beneath! Weakened or Damaged Muscles. A Tummy Tuck repairs and tightens the abdominal muscles, often restoring patient’s control of their abdomen. This restored muscular function will support the results achieved during the surgery, as well as improve the patient’s overall physical strength and mobility. Body Contour Overall. Restore confidence in your figure. A Tummy Tuck will tighten and contour patient’s abdominal appearance. Patients love the way they fit in clothing after their Tummy Tuck! A Tummy Tuck often requires only a single incision and leaves minimal scarring. A Tummy Tuck can performed by itself, or combined with another body contouring and facial rejuvenation procedure. A Tummy Tuck can be safely performed alongside liposuction, an arm lift, thigh lift, face lift, or rhinoplasty, to name a few of the other services we offer. Patients who are experiencing an extreme degree of skin sagging on their torso may be good candidates for a body lift. A Tummy Tuck is an important part of one of our most popular combined procedures: The Mommy Makeover. Patients at The Hamlet Clinic have the option of restoring their post-baby body to the tighter, more lifted figure they had before child labor with a personally-tailored Mommy Makeover. Mothers can achieve a flat, tight abdomen with a tummy tuck, lift and augment their breasts with a breast lift, and enjoy a more contoured, youthful figure with the help of targeted liposuction. Some of our mothers also decide to combine a labiaplasty with the other steps of their Mommy Makeover. Patients are invited to discuss their options when customizing their treatment plan. This will ensure they meet their desired goals for their appearance. We want every patient to receive the results they want, as efficiently and comfortably as possible. If you have hanging or loose abdominal skin, you may be a good candidates for a Tummy Tuck. If you have stubborn abdominal fat, excess tissue, or damaged abdominal muscles, you are a good candidate for the many benefits of this procedure. Ideal Tummy Tuck candidates are non-smokers who are at a stable weight. Candidates should accomplish the majority of their intended weight loss before receiving their Tummy Tuck. A Tummy Tuck is not intended to be used as a weight loss procedure. It is a solution for patients whose fat deposits refuse to respond to diet or exercise. Candidates who are dedicated to a healthy, active lifestyle will enjoy the outcomes of their Tummy Tuck for years to come! It is important that candidates maintain realistic but open-minded expectations for the outcomes achievable with any body contouring procedure. Candidates should be free of pre-existing conditions which could interfere with their body’s ability to heal from surgery. If you are concerned about healthy healing, discuss these concerns with your practitioner during your private consultation at The Hamlet Center. 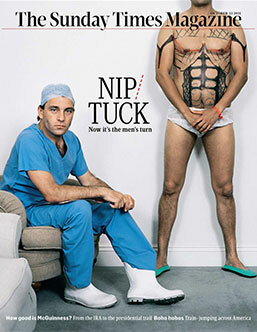 A Tummy Tuck is an excellent way for both men and women to reclaim their bodies. If your confidence in your body and image are affected by the appearance of your stomach, you may be a good candidate for the self-affirming outcomes we achieve with Tummy Tuck. During your private consultation at The Hamlet Center, your practitioner will be happy to answer any questions that you have about Tummy Tucks or any other cosmetic procedures. Your practitioner will go over your medical history, surgical history, and medication use with you. Once your practitioner has a good sense of your desired outcomes, he or she will create a treatment plan that both meets your aesthetic goals and achieves the most beautiful, natural-looking results that are right for your unique physique. 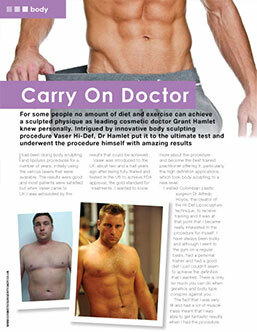 The Hamlet Clinic specializes in body sculpting and non-invasive cosmetic treatments. 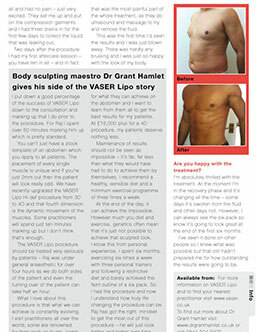 Dr. Grant Hamlet, founder of The Hamlet Clinic and specialist in the cutting-edge fat elimination method, VASER liposuction, understands the value of performing the right procedure, with the right artful eye, for every patient. Patients who are interested in combining their Tummy Tuck with additional procedures can receive a joint consultation. We are proud to partner with a number of highly-awarded board-certified plastic and reconstructive surgeons to guarantee our patients receive the highest quality results that are right for them. Every Tummy Tuck procedure is tailored to both meet our patient’s aesthetic goals and achieve outcomes that are best for their skin, musculature, fat deposits, and overall frame. Tummy Tucks at The Hamlet Clinic are most commonly performed with general anesthesia, but patients who are interested in local anesthesia can discuss the eligibility of their case with their surgeon. To perform a Tummy Tuck, your surgeon will make a single incision running horizontally between your hip bones, low in your abdomen. The incision is placed in a location where any potential scarring will be concealed by clothing or swimwear. The specialists at The Hamlet Clinic make Tummy Tuck incisions with the goal of leaving as little scarring as possible. Once your Tummy Tuck incision has been made, your surgeon will tighten or repair your abdominal muscles to restore tight, healthy abdominal control. Your surgeon will eliminate your excess tissue and fat using the methods you approved during your private consultation. 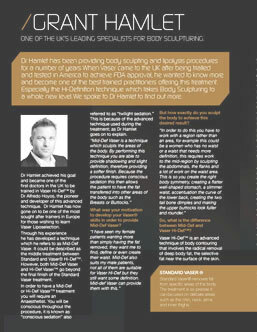 The Hamlet Clinic specializes in highly targeted, sculpted fat elimination with VASER liposuction. 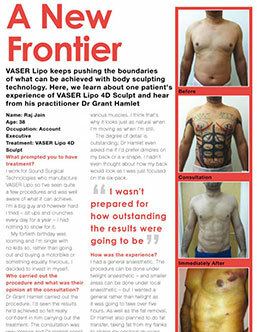 Patients who are interested in the benefits of VASER are invited to ask their practitioner for more information during their consultation. Once your excess fat and tissue have been addressed, the skin on your abdomen will be placed in a tight, flattering position over the stomach. If necessary, the belly button may be repositioned. Loose, excess skin will be removed. The incisions will be closed with sutures. Patients who only need to address excess skin, fat, and tissue from below their belly buttons are good candidates for a Mini Tummy Tuck. A Mini Tummy Tuck will also be performed with a single incision in the lower abdomen. Your surgeon will remove excess fat and tissue from below the belly button, and tighten or repair the abdominal muscles. Loose, sagging skin will be removed or tightened to achieve a smooth, flat contour over the lower abdomen. The amount of recovery time that a patient requires after their Tummy Tuck will depend on the extent of their cosmetic work, including the number of procedures the patient decides to receive during a single session, and where on their body they received their work. Most patients will want to take between one to two weeks off work following their Tummy Tuck to recover. Patients are encouraged to take short walks periodically during the first week of their recovery in order to maintain healthy circulation. Otherwise, patients are encouraged to rest as much as possible during this initial recovery period. Every patient will receive individualized recovery instructions. It is highly recommended that patients follow their surgeon’s instructions to see their best results. Bruising and swelling are not uncommon following a Tummy Tuck. Patients will receive a compression garment to wear during the first few weeks of their recovery, which will help reduce any bruising and swelling. The compression garment is also an excellent way to promote the body’s acceptance of its new, slim shape. If patients receive drains, they will receive instructions for their care. As post-procedure bruising and swelling diminish, patients will see their abdomen become flatter and more contoured. Patients will get a sense of their final results within six weeks of the Tummy Tuck, but these results can continue to improve over the months following the procedure. Your Tummy Tuck will remove the skin, fat, or tissue that is creating a bulging, sagging, or unhealthy abdominal appearance. The results we achieve at The Hamlet Clinic are artful: your body contour will be what looks both flattering and natural to your body. Look and feel good, working out, dressing up, or at the beach, thanks to a Tummy Tuck! The price of a patient’s Tummy Tuck will depend on the details of their individualized procedure, such as the type of Tummy Tuck being performed, and if multiple procedures will be combined to achieve the patient’s desired results. Once your one-on-one consultation with your surgeon is complete, you will receive a cost breakdown that reflects your unique treatment plan.